A single early production armchair model 'Senior' designed by Marco Zanuso for Arflex Edition 1951 set on brass tubular legs. 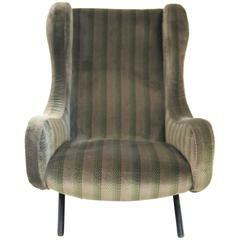 Marco Zanuso was an Italian architect and designer who worked with Arflex during the early 1950s designing furniture which had visually exciting new contours for the time. During this time his 'Lady' chair design (very similar to the 'Senior' won first prize at the 1951 Milan Triennale. Zanuso then went on to work with Richard Zapper, a German designer well known for his technical innovation in design. Large pair of teal velvet upholstered steel framed circular shaped tub armchairs on steel cuboid feet late 1980s. 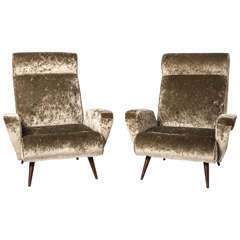 Pair of Senior armchairs by Marco Zanuso for Arflex, 1950s, recently re-upholstered in a blue-grey silk velvet by Holland & Cherry. 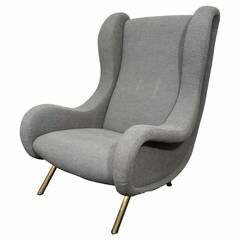 Senior armchair by Marco Zanuso for Arflex, ready to be reupholstered. A stunning authentic Marco Zanuso senior chair, Arflex, France/Italy, 1960s. The fabric has some stains and so requires re-covering. Marco Zanuso, "Senior" armchair, Textile and metal lacquered feet, circa 1970, Italy. Measures: Height: 99 cm, seat height: 35 cm, width: 76 cm, depth: 75 cm. 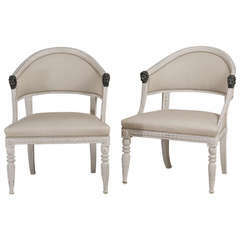 Early pair of Senior chairs designed by Marco Zanuso for Arflex. Newly reupholstered in velvet.